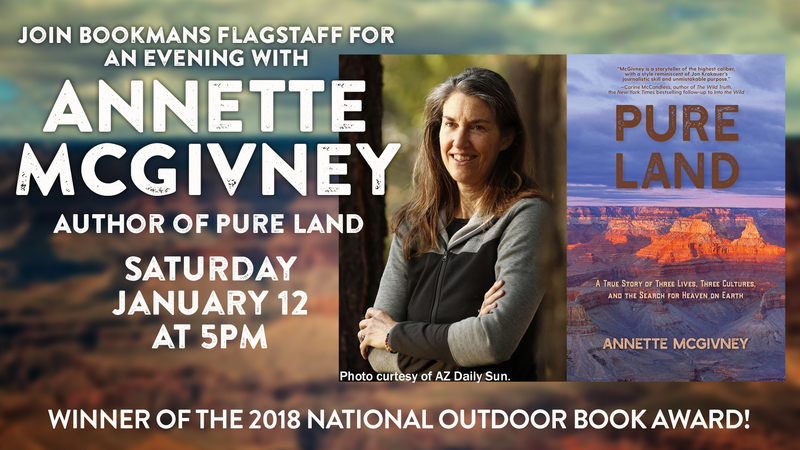 An Evening With Annette McGivney Author Of Pure Land Bookmans Entertainment Exchange Flagstaff 1520 S Riordan Ranch St.
12jan5:00 pm6:30 pmAn Evening With Annette McGivney Author Of Pure Land5:00 pm - 6:30 pm Bookmans Entertainment Exchange Flagstaff, 1520 S Riordan Ranch St.
Join Bookmans for an evening with Annette McGivney, author of Pure Land. This event will include a short reading from the book and a Q&A followed by an opportunity to have your copy of Pure Land signed by the author. Taking place Saturday, January 12th at 5:00 PM in the Bookmans Cafe. Copies of Pure Land will be available for purchase before the event and guests can enjoy a 10% discount on coffee and tea in the cafe. Taking the world by storm and winner of the National Outdoor Book Award for Literature Pure Land has been flying off Bookmans shelves. An in-depth into the lives of three very different individuals, a gruesome murder and the idyllic landscape the Grand Canyon, Pure Land is the book everyone is talking about and we can’t wait to host Annette McGivney for an evening of discussion and storytelling. Click here to learn more about Pure Land its author Annette McGivney. Copies of Pure Land are available for purchase at Bookmans Flag. Though we cannot guarantee stock, feel free to give us a call and we will be happy to check our shelves for you.